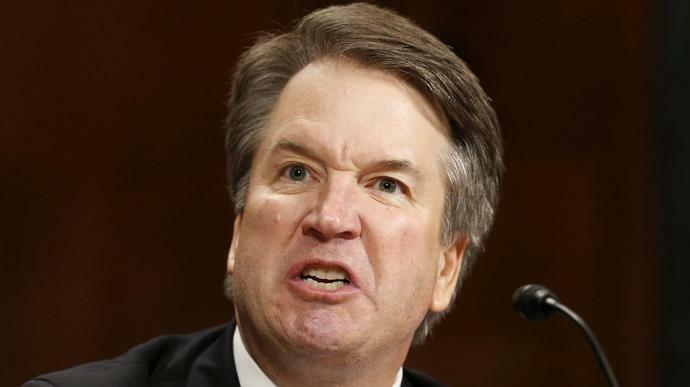 More than 500 law professors from nearly 100 law schools around the nation have signed a letter to the U.S. Senate to say that the volatile temperament Supreme Court nominee Judge Brett Kavanaugh displayed on Thursday as he testified before the Senate Judiciary Committee disqualifies him from sitting on the nation's highest court. "We regret that we feel compelled to write to you to provide our views that at the Senate hearings on Thursday, September 27, 2018, the Honorable Brett Kavanaugh displayed a lack of judicial temperament that would be disqualifying for any court, and certainly for elevation to the highest court of this land," the letter says. The legal experts fault Kavanaugh for failing to remain open to the necessary search for truth after being accused of sexually assaulting a girl when he was a teen and instead becoming "repeatedly aggressive with questioners." The signees also criticize the judge for indicating that he believes allegations made by professor Christine Blasey Ford and other women are "a calculated and orchestrated political hit" by members of the Democratic Party rather than acknowledging that the Senate must try to understand and investigate the facts surrounding the allegations. "Instead of trying to sort out with reason and care the allegations that were raised, Judge Kavanaugh responded in an intemperate, inflammatory, and partial manner, as he interrupted and, at times, was discourteous to questioners," the letter reads. The law professors cite two statutes, governing bias and recusal, that require a judge to step aside if he or she is at risk of being perceived as being unfair. The FBI is investigating Blasey's allegation that a drunken, teenaged Kavanaugh pushed her into a room, pinned her on a bed, groped her and covered her mouth when she tried to scream during a gathering of high school friends. Kavanaugh has denied her allegation, along with allegations of sexual misconduct from two other women. On Friday, Republicans gave the FBI one week to look into these claims. Senate Majority Leader Mitch McConnell (R-Ky.), who is eager to put Kavanaugh on the court, regardless of the allegations against him, said Tuesday that he's aiming to hold Kavanaugh's confirmation vote this week. "We have differing views about the other qualifications of Judge Kavanaugh," the professors state in the letter. "But we are united, as professors of law and scholars of judicial institutions, in believing that Judge Kavanaugh did not display the impartiality and judicial temperament requisite to sit on the highest court of our land." Another open letter was also made public Tuesday, this one directed at Sen. Susan Collins (R-Maine), signed by more than 800 faculty, administrators and staff at colleges and universities who live and work in Maine, urging her to vote no on Kavanaugh's nomination. All of the signatories have students and colleagues who are survivors of sexual violence, and many who signed the letter are survivors themselves. "We are at an historic juncture, and your vote, your words, and your actions as our representative will be a focal part of what happens this week," the letter to Collins says. "Will you send a message to the tens of millions of American women and men who are victims of sexual violence that their experiences will be met with indifference and even disbelief? Or will you make a choice for the greater good, and send the message that survivors can trust that they will be heard if they have the courage to come forward?"